We provide roof repair services in the Barrie, ON area and are known for our seamless, detail-oriented work. Many different things can damage your home’s roof over time and threaten its durability and functionality. 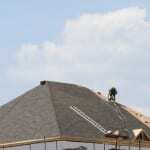 If you believe that your roof could use some work, turn to us at Slippery Slope Roofing. We provide roof repair services in the Barrie, Ontario area and are known for our seamless, detail-oriented work. Some of the shingles on your roof have become loose or entire areas on your roof are missing shingles. Water is able to leak through your roof when it rains. Your roof sags or dips in certain spots. You find small granules from your shingles in your home’s rain gutters. You notice that your heating or cooling bills have changed drastically within a short period of time. If you notice any of these signs, we encourage you to keep in mind that the problem won’t fix itself on its own and may even get worse if it’s ignored. For these reasons, when you present a roof repair job to us, we’ll take care of the repair process is an efficient manner and do everything in our power to avoid unnecessary delays. Thanks to our extensive experience and accreditation with the Better Business Bureau, you can rest assured that we will be able to take care of your roofing problem in hardly any time at all. Please don’t hesitate to contact us at Slippery Slope Roofing if you have any questions about our roof repair services. With our storm damage repair services in Barrie, ON, we’ll get your roof fixed in no time.However, detecting that your roof is in need of storm damage repair services from a qualified, experienced roofing company is easier said than done. We think you’ll be blown away by how professionally, efficiently, and reliably we handle the roofing repair process in Barrie, ON.As roofing repair professionals who serve the Barrie, Ontario area, we have over 50 years of experience working on roofs and guarantee we can fix up your roof without any problems.